With the same operating principle that we have seen for the color, we can also use different types of line, which can be set through the second* drop-down menu on the “properties toolbar”. *The third further down, if you use the ribbon tool. In this window, we still see the lines already on the drop down, that is, those that are currently loaded. 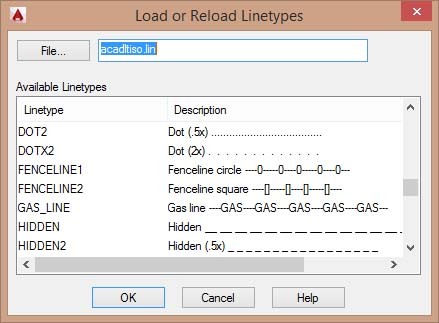 This second window refers to a system file of AutoCAD (acadltiso.lin) on which are planned the various types of line. Using the scroll bar, or mouse wheel, can scroll through the available line types, hold down the “Ctrl” key on your keyboard and select a few to load, (usually using the “Hidden” and “Center”); then press OK and the lines are loaded into our design choices. They should then appear in the first window of lines available, and then you still click OK to close the first window. 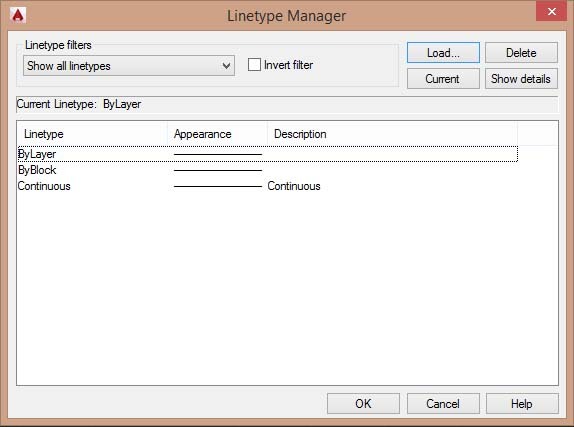 Now after selecting one or more lines and objects we can change the “linetype” trough the drop-down menu, in the same way that we change the color, that is, selecting the type of line you want. By choosing the linetype "HIDDEN", selected lines become dashed, but the size of the dash will be dependent from two variables or scaling factors.